This is another popular Medlock Design frame amongst collectors in the USA. 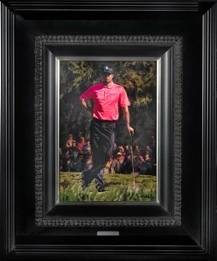 Although typically used in framing his NASCAR, Hockey and Football paintings, many of his Tiger Woods paintings look absolutely stunning with our bold Ebony Museum Frame...complementing Tiger’s usual Sunday attire of Black and Red. 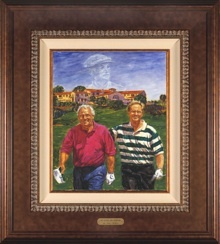 The aluminum plaque inscription of the Title of the painting is a great way to accompany your Scott Medlock fine art piece. All Scott Medlock frames are made in the USA. Our Museum Frame is Scott Medlock’s favorite frame for his paintings, and as a result has become our Premium Signature frame amongst collectors worldwide. The Museum Frame is our most popular with a bold aged-antiqued high quality Museum look. The brass plaque inscription of the Title of the painting is an elegant way to accompany your Scott Medlock fine art piece. All Scott Medlock frames are made in the USA. Our Burl Frame is very versatile and a popular choice amongst home and office decor. Displays nicely in a classic, elegant office setting, as well as a contemporary themed environment. Also, a safe framing choice for a gift. The brass plaque inscription of the Title of the painting is an elegant way to accompany your Scott Medlock fine art piece. All Scott Medlock frames are made in the USA. Please note that select images are available unframed—either mounted, stretched or unstretched. Also, select images are available in various sizes as Limited Editions and Open Editions. All Limited Editions are accompanied by a Certificate of Authenticity. Please feel free to call us regarding the availability of original paintings. Private Commissions are welcome.